Hey everyone, hope you are all well! 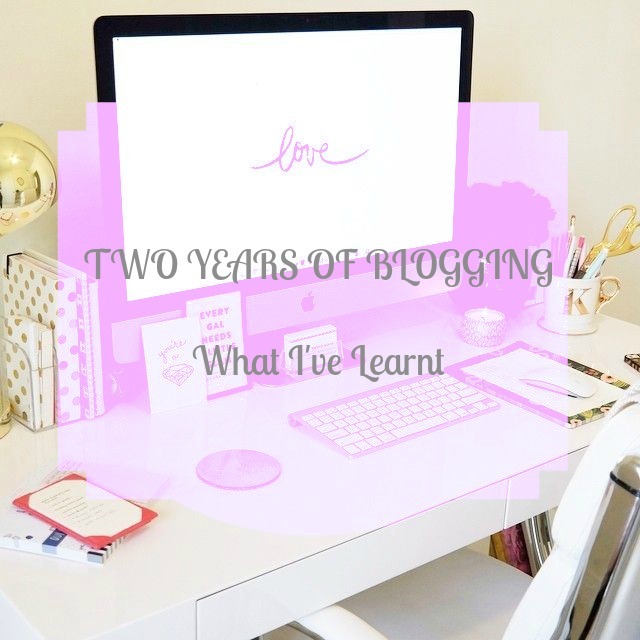 So next Month it will be two years since I started to blog. You're probably sitting there thinking but there are no posts from December 2012 on your blog and that is because I deleted them as they just didn't fit in with my blog. There was a lush haul (I deleted it because of the lighting) and a review of the movie Pitch Perfect which again I deleted because it just wasn't to do with anything I wanted my blog to be about. Quite frankly these posts were embarrassing. When I started this blog I wasn't exactly sure if I wanted this blog to be beauty, fashion or lifestyle. I decided on the latter and decided to make this blog a triple threat and include all three. I have to say it's definitely more beauty than the other two but it's definitely something I will try and work on in 2015. Since blogging there have been so many things that I have learnt that I thought I would share five of these things with you all today. Maybe you are interested in blogging in the future or you already have a blog and are struggling with a few things. Maybe this post will help you. This by no means means that I am an expert. These are just a few things that I have found have helped me and will hopefully help you. Enjoy! I'd thought I would start off with this bit as it contains the most information about what I've learned and a few tips for you as well if you are a new blogger. From the minute I started blogging I already knew that this one was a massive factor in getting people to start reading your blog. I have three absolute favourite platforms that I absolutely love to use. Twitter, Pinterest and Bloglovin'. I have found twitter to be the most beneficial purely because you can find so many other bloggers, come across different types blogs and just generally meet and get to know other bloggers. Depending on your blog type you can also take part in bloggers chats that happen weekly. Before I went away to Turkey I used to take part in the beauty bloggers chat which takes part ever Wednesday and Sunday evening from 8PM to 9PM. This is a fabulous opportunity to talk to other bloggers and exchange blog links. This is done using the hashtag #bbloggers. If you are a fashion blogger or lifestyle blogger the hashtags are #fbloggers and #lbloggers. I've met so many amazing people and come across so many beautiful and inspiring blogs as well. Once you have come across these blogs and followed them if you come across a post you like then one thing I always like to do is post a comment on their blog just so they know they've gained another reader. It's happened to me and it's honestly one of the best feelings knowing that people like to read my blog. Pinterest is another one of my favorite apps purely because there is so much inspiration on there in terms of blog designs and it's also another way that you can follow bloggers because you can post your blog photos on there so it's easy to know when your favourite blogger has just posted. Now as popular as pinterest is not everyone has it just yet. Thankfully all my favourite bloggers do but if you want to get some inspiration for some posts then pinterest definitely helps me. Bloglovin' is absolutely amazing for following new blogs as it's super easy. It is also amazing for finding new blogs in different categories. The majority of blogs that I follow are beauty and fashion based but I have decided to leave a more healthy and active lifestyle recently so I absolutely love finding and following healthy food and fitness blogs as well! Bloglovin' also have an app so if you are stuck on a train or bus you can just whip it out and catch up on posts. Amazing site to use! When it comes to blogging this is probably the first thing I learned. Organisation is so incredibly important when it comes to blogging. I used to think it was just a case of getting an idea and typing it up with a few photos. Definitely not the case. You need to come up with the idea, bullet point what you want to talk about, take the photos, edit the photos, go through the bullet points one by one, make sure the points are in order and that it flows, edit the post if need be and then publish the post. I have a special blogging book which I have reviewed HERE if you'd like to take a look at that. A lot of work goes into a post but it's all worth it when you see the finished post. One thing I have learned about blogging, and it was actually in a topic tonight for the lifestyle bloggers chat is that it is extremely easy to become jealous of other bloggers and compare yourselves to them. I can think of 5 bloggers at the top of my head who yes I am a little envious of due to their good looks and amazing blogs. It's okay to be a little jealous as long as you don't let it overtake you and become nasty about it. Blogging can get competitive at times in terms and we find ourselves thinking in our heads, why does she have more followers than me? What's so special about her? Why does she get free stuff? It took me a long time to forget all this, focus on my own blog and just remember that it's not all about the followers or free stuff. It's very easy to get sidetracked and jealous but it's just as easy to forget all that and blog because you love it, which I will come too again later. When I started this blog I knew that I wanted it to be mainly beauty based. However I then found out that it is important to add a few different posts in there every once in a while just to keep my blog fresh. I've added wishlists, lifestyle and fashion posts into my blog as well as a few advice and obviously blog posts about my adventures in Turkey as well. I just think that it is important for me not to seem like a make up or skin care reviewing robot. People like to know the girl (or boy) behind the blog so I definitely think including some lifestyle is 100% important. I haven't yet done any personal posts on this blog as I am scared of what people think but I do have a few typed up and saved in my drafts to make sure to stay tuned for them as they feature a range of extremely popular topics. This is something that I learned at the beginning when I first started this blog. It got to the point where every idea I had for blog posts just go typed up and saved and posted almost immediately that when it came to the next month I had absolutely no idea what to post about and I absolutely hated it. I love blogging but I didn't really want to blog for the sake of it, I wanted my passion to come across in my writing so I used to take a break but I used to feel extremely guilty. It took me a long time to realise that taking a break is okay as blogging is a hobby. It's not my job and it's not something I have to do. During the summer I was away for six months. During that time I probably blogged around 4 or 5 times and as much as I missed it I have come back with so much more inspiration and I am enjoying it so much more. So if you ever feel like you need to blog every single day but have nothing to blog about do not worry. Go out, get some fresh air, take a few days break and I can guarantee that you will find some inspiration from somewhere. That's what I've learned anyway. Lastly but not lease one of the most important things that I have learned since starting this blog is that it is important to blog because you enjoy it and not because you feel you need too. Once you are a few months in and are starting to get readers it is easy to feel like you have to blog especially if they start leaving you comments telling you to blog about something. You can often end up feeling bad for not doing it or end up feeling like you have to do it there and then. These are the things that can make you stop enjoying it. It's why I admire the big youtubers like Zoe, Naomi and Louise so much because although they all have youtube channels they still have blogs and yes they might not blog all the time but when they do you can see through their writing that it is because they wanted to and because they do still enjoy it. It is also extremely important to not blog for the free stuff. Yes it may get annoying when you see a blogger write about something they got given for free but one of the main things to remember is because they got that for free because they work hard and because companies can see their passion and enjoyment through their writing. If you just blog for the free stuff then I'm afraid you are blogging for the wrong reason and that can come across quite easily so just make sure that you enjoy what you do, blog because you love it and eventually other people will see the same thing too. So there we have it. What I've learned since I've started to blog and some advice that I hope will help those of you who are thinking about starting up a blog in the near future. I'll add a little disclaimer here by saying just because I did this post it definitely does not mean I am an expert. I still have so much to learn in terms of photography and writing styles, however if you would like me to do a second post with more things that I've learned then please let me know. If you have any questions then please feel free to tweet me at @xbellefleurx. I'm constantly on there so you can be sure of getting a response haha!